Any other kitties that were once wild? What is your rescue story? Do you like your humans? My brother and I are considered to be "Ferals". They clipped our ears and everything before our family took us home. My mom gets pretty sad about that. Our story goes like this. We were born outside a department store, and lived near a dumpster until one day this lady found us. We were so afraid, we had been abaondoned, and I wasn't so sure about these "humans" anyway. Eventually she won our trust. We were then put in with a foster family and not in a pound. The foster family would keep us during the week and on Saturday's we would go to Petsmart to wait and see if anyone wanted us. Then in October 2002 a man and woman came into the area where we cats were. (All in cages of course) They played with us, and loved on us. Then they walked out! I was sure this was our family. Then some guy and his girlfriend came in. She thought we were "pretty" but he thought we weren't WORTH the money they were asking for. Right outside was the first man and woman. Suddenly I saw her lean over and whisper something to her husband. She looked angry at that man! Well, they filled out some kind of form, and next thing I knew my brother and I were on our way to our new home! It took us a little while to adjust, actually... it took me a lot longer. I'm now a very happy well adjusted cat. Just this morning I was sitting in the window looking outside and thinking that I had been left out there, and now I'm in a nice home, with nice food, and nice parents! Ah.... that is such a great story Ambrose. How long did it take you to adjust? 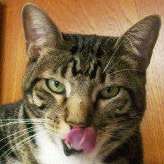 Here is my story (told by mom): I worked at a vet clinic, as a kennel attendant, and a woman brought in 7 feral cats to stay overnight because the local shelter could no longer keep them. There was one that everyone thought was a kitten, and the woman conviced me to take her, in fear that Bailey would die if forced to live on the streets again. Bailey was 2 pounds when I got her, and she was NOT a kitten, like we had first suspected....she was one year old! She had an upper resperitory infection and an eye infection, and was very sick and malnurshed, but I nursed to her back to health. I was a little worried about how my dog would react, but they ended up being best friends. Bailey even has a scar by her left eye, from livin' on the streets! Anyways, for the last year, she wouldn't come near me, but after my dog, Zero passed away (he was Bailey's best friend), she wouldn't leave me alone! She now loves to be cuddled and brushed by me, constantly. My kitty mom, brothers & sisters live in the woods out back of my mom. I'm so feral I have only let mom pet me once. I am on a journey right now and mom hasn't seen me for a few months. She thinks I will not come back but hopes I will. She still puts food outside. My brothers and sisters and I were born feral, and shortly after taken in by a foster home through the shelter that my mom adopted me through. Apparently, it took all of us a while to adjust to people. It's so hard for me to imagine that, because now I *love* people to death. I soon proved to be the most outgoing and friendly of my siblings. All it took were a few nice cuddles and I was sold on the human companionship idea. Now I have a great home with two wonderful humans and a kitty sister. I love it! I was a feral kitty living all by myself. One day meowmie saw me passing by she ran inside to get me some food. It was right after we had some snow and she wondered how I survived by myself. So I came to eat everyday. I got pregnant right after she met me and I gave birth to two kittens in the bushes by someone's porch. I moved my kittens closer and closer to meowmie's apartment. When my kittens were 8 weeks old, I took my kittens right up to meowmie's porch. But the very next day, I came for food with one of my kittens, but not the other. My male kitten had disappeared. Meowmie was heartbroken and tried to find him. Then I got pregnant again. Meowmie was trying so hard to get my female kitten and me to trust her. When my female kitten was almost 4 months old, she disappeared for 3 days and came back with a UTI. So meowmie caught her and took her to the vet. So from then on, she was an indoor kitty! A week later, I was ready to have my kitttens. I'm glad meowmie was home. I gave birth to 4 kittens in the bedroom. (Before Kahlan got sick, meowmie let me and Kahlan inside, but we didn't like it. We made so much noise, she let us back outside.) I adjusted very quickly to living inside and I don't miss living outside. If meowmie hadn't been there both times I was pregnant, I would have had a rough time without food. Meowmie says I'm a great kitty. I always use the litter box and I'm very quiet. My meowmie kept one of my kittens and three went to new homes. All of us are fixed and had our shots. I love my meowmie! Feral through and through...born in a colony of feral cats in an abandoned house... I am not crazy about people, but I love the dog. I do not like to be held or get pets. I gave my human Cat Scratch Fever. I am neutered but I still know how to mark my territory.I love to hunt live things. I am Frankie the Feral! Frankie: I feel the same way... dogs are way cooler than humans. Aphrodite: That is a wonderful story! I was feral for 6 weeks, I was born to a feral Mom. My arrival story is on my profile. All of my brothers and my sister were taken in. My Mom is still feral as far as we know but she is being fed regularly by a neighbor. My one brother lives next door at my human Mom's inlaws' house and we play together a lot. Wow, you guys have some great rescue stories! Mine isn't as interesting, but I'm feral all the way. Mom has a REALLY big fenced yard, and at the time didn't have a dog, so I moved into her yard since it was a safe place with lots and lots of birds, squirrels and stuff to hunt. Mom started feeding me just in hopes of stopping the daily carnage ... she didn't have any expectations that I'd ever trust her. It took a long time, but eventually, I would come up and rub against her if she was sitting on the ground. Then I would curl up in her lap, but she wasn't allowed to touch me, or I'd bite. Eventually, that graduated to full-fledged petting, and I moved myself into the house one day. Mom then got me neutered, and I've been here ever since. I LOVE my mom, but am not thrilled about most humans. And as affectionate as I am, I'm still a wild cat. I'm nice until you scare me, then all the weapons come out. I've sent 2 humans to the emergency room, but Mom loves me anyway. And I'd NEVER hurt her. Boy, I loved my carefree life out in the streets...I spent my whole 1st year answering to no one and no other cats. It took my Mimi 2 months before she could trick me into her waiting pet taxi, and another 6 months to realize what a good home and good food were all about. I even like being petted and treated like I'm special now. Great stories, Gomer and Gypsy! I was born in a dumpster at my mom's old apartment complex and had quite a few siblings. Unfortunately, none of them survived. My mom tried to catch me for many weeks and was finally able to when it froze one night and I was sick on a neighbor's doormat. I couldn't move and my eyes were crusted shut with infection, so she was able to pick me up and get me right to a vet. You should see the picture of me on my page the day I was brought home - very sorry sight! I was born to a felal mom and then she disappeared. It was pretty bad. I wasn\'t treated well and had to lern to fight. Somebody somewhere hit me too. I don\'t remember this but mom says she can tell this happened. I did a great job fending for myself until some people picked me up and threw me in a cage. They took me to the pound and put a sign \"unadopatable\" on my cage. I did have a foster mom who took me to her house once in awhile. Then one day someone came to the cage and said \"This cat\'s not unadoptable.\" and they took me to their house. My foster mom cried and cried. Due to all this trauma, I don\'t trust humans one bit. Here's my story from my mom's point of view- I found her 6 yrs ago shortly after my father passed away. She was a feral cat. We found her in an old shed/barn in the middle of over 1000 acres (surrounded on on 4 sides by water) in Gadsden Alabama. A friend of the family owned this acreage and nothing was there but his horses which ran free on the property. No one knows how she got there. She was skin & bones, sick and unapproachable which is why the way she acted soon afterwards is so astonishing. As we all know, cats do not come when called, for the most part, much less a feral cat. She did. I called her from the back seat of our SUV (food in hand) and she flew into the vehicle! She didn't go nuts as we expected but the exact opposite. On the 3 hour trip home got into my arms and laid down. Mind you, she was a wild cat. A song came on the radio reminding me of my father and I got really upset and started crying. This wild cat put her paw on my face the entire time as I cried. Almost if to say it's OK, I'm here. My husband's mouth fell open. After treatment at our vet for many different things, Sweetie came home. I don't bieleve in reincarnation, but I do believe Sweetie was sent to me from above. God, my dad, maybe some of both, but how else do you explain the things she did/does. She would only let me, my daughter and my brother (who only visited us a couple times a month) hold her. She even kisses me at night next to my eye just as my father used to at night. Sweetie also has a mole over her eye (just as my dad had). How many cats do you know have a mole? The bond I have with Sweetie is like no other bond I have ever had with any animal. I can't explain it-she is different. I truly believe she was sent to me. She is my angel. Here's my story from my mom's point of view. Here goes... Since I was oh, say 9 or 10 my family has a favorite Chinese restaurant "Magic Dragon" that we eat at quite often. One afternoon around Aug '03, my daughter and I were eating lunch and spotted a lone siamese kitten about 6 mths old wandering the parking lot. I talked to the owners of the restaurant and they informed us he had been coming around for a month or so but noone could catch him. We boxed up our leftovers in hopes of coaxing him to us but when we approached him, he of course ran. Little did he know he bacame our project! Every time we ate dinner there we would request a seat by the window and sure enough after awhile he would appear from the nearby bushes. It got to be we kept a bag of cat food in my trunk and would feed him every time we made a trip into town. Sometimes we'd see him sleeping in the bushes all curled up in the rain. It was so sad! Months passed and the weather was turning colder. I knew we just had to get him soon. So, one night with a borrowed trap in the back seat we set off to eat dinner at Magic Dragon once again. We set the trap with tuna (of course!) and went into eat by our usual window seat (by this time the restaurant owners were all excited about someone finally catching him too!). Well, I guess it was the tuna because it took him all of about 15 minutes and we had him!!! We fondly named him Magic. He lives on our screen porch, as he still has never wanted to stay "inside" very long. Although a nervous cat, he will now get in my lap, rubs around my legs and LOVES to be petted. He gets to run in the yard most every day (supervised) and has seemed to adjust to domesticated life quite well!